The TVS-872XU-RP features high-quality hardware and expandable architecture, enabling optimum performance and flexibility to fulfill business needs in performance and application diversification. The TVS-872XU-RP provides two 10GbE SFP+ ports that use the Mellanox® ConnectX®-4 Lx SmartNIC controller. They support the iSCSI Extensions for RDMA (iSER) protocol, allowing data to bypass general network drivers, the socket layer, and to directly enter memory buffers of the ESXi server and storage to offload CPU workloads. When both the VMware® server and the TVS-872XU-RP support iSER, it can provide up to 60% increased random read/write performance and 50% decreased latency, providing an essential tool to optimize demanding virtualization applications. The TVS-872XU-RP provides multiple PCIe slots. 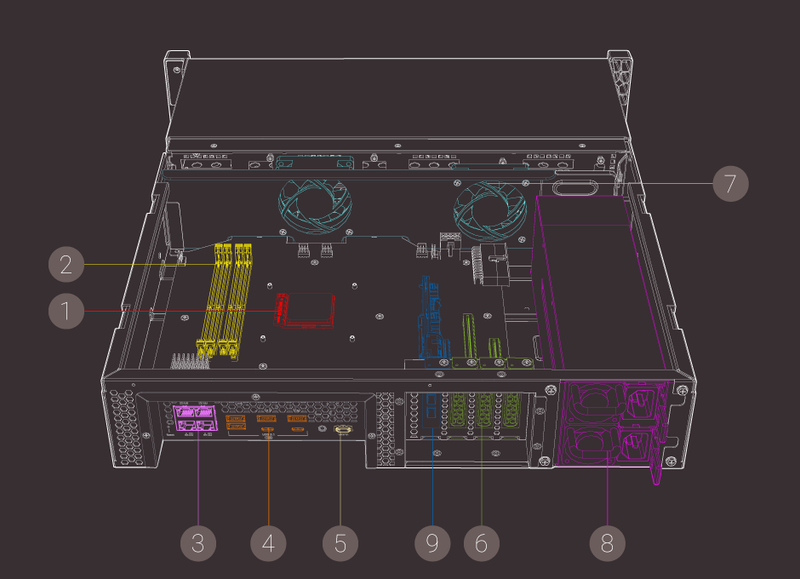 To ensure that the SATA drives have sufficient bandwidth, it is recommended to only use low-end expansion cards, (such as a 1GbE NIC, USB 3.0 card, or Wi-Fi adapter) with the PCIe Gen2 slot (Slot 1, 3, 5) as this slot is connected to the PCH. For high-end expansion cards (including 10GbE/40GbE NICs, SAS cards, Mustang-200 acceleration card, and graphics cards), it is recommended to use PCIe Gen3 slots (Slot 2, 4) as these slots are connected to the CPU. Graphics cards are optimized for graphical calculations and transformations. The TVS-872XU-RP provides PCIe slots for installing an AMD Radeon™ or NVIDIA® graphics card to boost data-intensive AI machine learning, while also providing benefits for imaging processing and virtual machine performance (via GPU passthrough). Datasheet for QNAP TVS-872XU-RP is coming soon.